We have been operating from Ashbourne, Derbyshire since 1992. Fitting doors is a specialism in its own right. Our fitters have to be part joiners, part mechanics and part electricians. Fitting is a core part of what we do and we are experts. I don't think my garage door opening is a standard size. Is there a door to fit? There is an enormous range of standard sizes now available so there is nearly always a standard size to fit. If not doors can be made to measure at very little extra cost. Do I need a new door if I want remote control? We can electrify about 90% of existing doors. Contact us to discuss your requirements. Do I want Sectional, Up and Over, Roller or Swing garage doors? Sectional are the best for all round functionality. Park right up to them, maintenance free, high security, they can even be insulated to allow the garage to be used as another room. They are, however, limited in their looks and that is the principle reason that the other door mechanisms are still around. That, and tradition of course. Up and Over come in a vast range of designs in finished steel, Fibreglass (GRP), or timber. If you have a particular visual requirement or want to match woodgrain windows, Up and Over is the answer. On the downside they are not as secure as sectional, open out so you can’t park right up to them and are not insulated. Roller Shutters have similar benefits to sectional doors but naturally are only horizontally ribbed since they have to roll up. They come in a range of colours including woodgrain shades to match woodgrain double glazing. Swing Doors (side hinged doors). Can be useful if you nip in and out often to get to the freezer for instance but not for the car as you have the devil of a job to open them both, peg them back and then do the whole thing in reverse when closing. Strangely enough old fashioned swing doors work extremely well with remote control. Steel doors, these days, are galvanised and then tough heat treated paint used so that they are just as tough as car paint. (In fact the better manufacturers use a thicker grade of steel so they don’t dint as easily as a car) Some manufacturers offer a ten year warranty. GRP (fibreglass) is used in up and over doors. Being plastic it is maintenance free and usually incorporates a steel subframe to add strength. The original pattern used is wooden so that the finished product looks very much like timber. (much more so than woodgrain uPVC windows) Even experienced garage door professionals have been fooled by GRP doors and have had to knock them with a knuckle before realising they were not timber. Timber is great for those who love the look and feel of real wood and don’t mind a bit of maintenance. Cedar is most commonly used as it is resistant to rot, and doesn’t shrink or expand much in comparison to most other woods. The top of the range doors are sectional in hemlock that have the functionality of sectional and the looks of timber. They are stunning. In the local area we offer a repairs service. Springs and cable fail with time and spares are still available for most doors. Give us a ring and we can advise on likely cost and make an appointment to fix it. We also offer a repair service for remote control operators, contact us for more advice. Do remote control systems require servicing and can they be repaired? Yes, if out of adjustment or if the door itself is not working correctly the remote control system can fail due to wear. Although most people only phone when it’s too late we do offer servicing for remote controlled doors. If your handset goes through the wash we are able to get replacements for most operators and if not replacement external radio kits are available. Which is the best manufacturer? Whilst there is a good deal of overlap in the product ranges of the manufacturers the most appropriate choice of manufacturer depends on the type of door required. After a long period of underinvestment the main UK brand names are now mostly foreign owned. We supply doors from all the main quality manufacturers. No, we don’t charge to make a home visit as we need to see what is involved to leave you with an idea of cost and options. 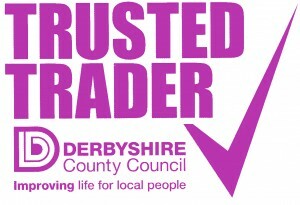 Being based in Ashbourne we cover the vast majority of Derbyshire and North and East Staffs. Contact us to arrange a free visit today. We supply garage doors in Derbyshire and garage doors in Staffordshire.